For most men, socks are a staple. Something to pick up, not pick out. Ever used a socked foot to sop up a small spill when no one was looking? Come on, man. But a well-chosen pair is an opportunity to inject some style into any look—casual or formal. Here's how to step up your sock game. Low-cut socks: These hit at the ankle and are designed for athletic activity. 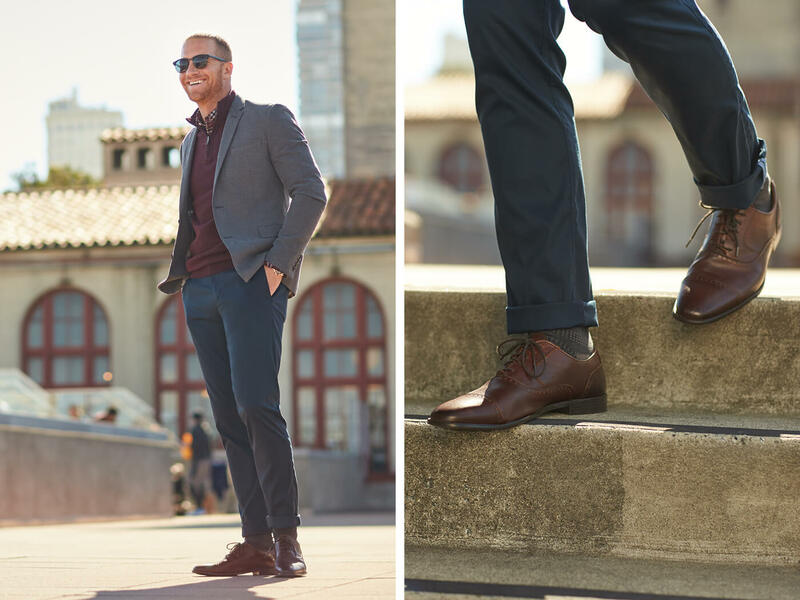 Even lower-cut socks can help you achieve a “no show” look, but in either case, color isn’t that important. Mid-calf socks: The all-arounder. These are by far the most popular and most versatile length of sock. Mid-length socks are suitable for work, casual events and semi-formal functions. Because of their ubiquity, you’ll have no trouble finding a color or pattern that works for you. 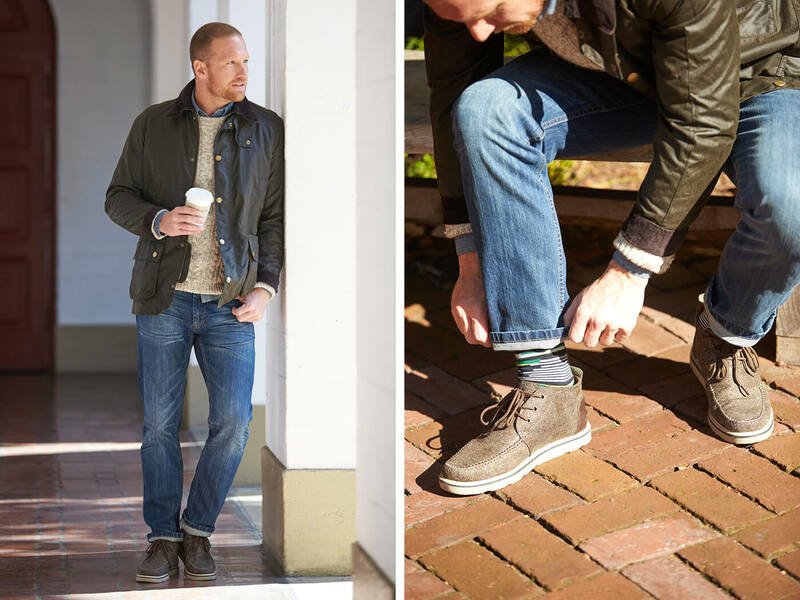 Over-the-calf socks: This more traditional length goes all the way up to your knee. The added material means you’ll be choosing this more expensive option for special occasions, mostly. Gray: There are way more than 50 shades. 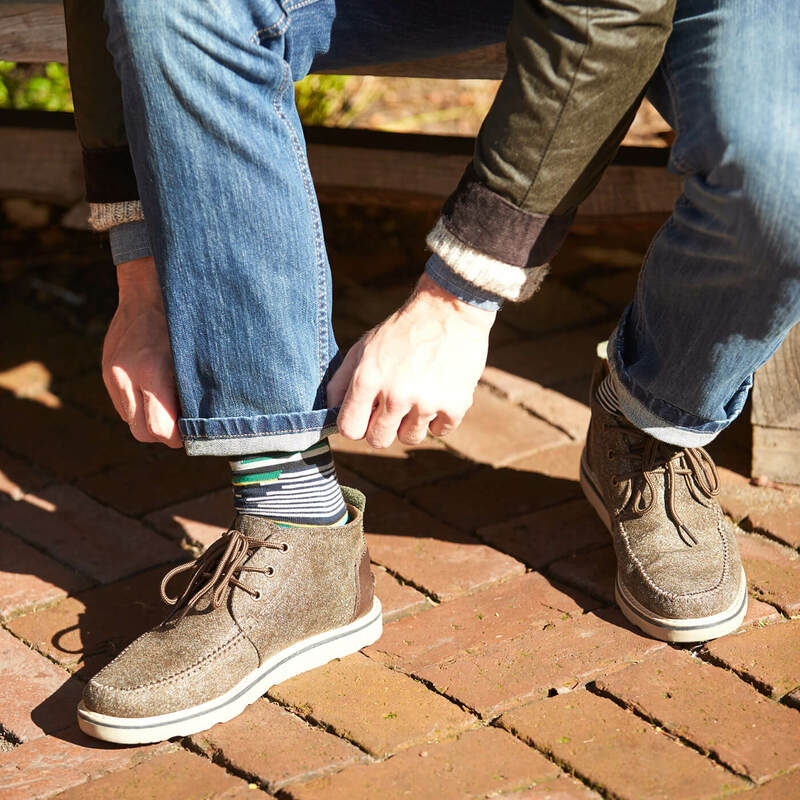 From ash to charcoal—and everything in between—gray socks are a simple way to add contrast to your trousers. Earth tones: Taupe, brown, tan, off-white. The beige family might not scream scintillating, but trust us—it’s infinitely more interesting than a pair of white crew socks. And these colors will work with pretty much anything. Stylist Tip: Roll the cuff of your trouser up slightly to show even more sock. This works for both dressier pant styles and denim. Contrast is key: If you’re wearing a light-grey suit, don’t wear light-grey socks. Similarly, complementary color theory (remember the color wheel from art class?) is useful when matching your socks with a dominant hue in your wardrobe, e.g. socks in the orange/red range are a good accent for a baby blue shirt. Match your clothing, not your shoes: First, match your socks to a color in your shirt or tie. Then select shoes that work with your overall outfit. Consider the season: It’s not written in stone, but colors like lime green, yellow and lavender are better for spring and summer. Cooler weather, cooler colors. You can wear green and red during the holidays, but no candy cane striped socks, ever. While patterned socks might seem daring, the concept is actually very classic. It’s hard to go wrong with patterns, but a good rule of thumb is: Your sock choice should complement and not compete with your outfit. Stripes: If it’s good enough for Where’s Waldo, it’s good enough for you. Gingham: Did you know gingham is plaid with two colors? Let’s just call it checkerboard. Plaid: The golfer’s delight. If you don’t already own some plaid socks, you should. Polka dots: It’s not clear what dots have to do with oom-pah-pah music, but you can enjoy this pattern without liking the accordion. Paisley: Not just a solid name for a fancy cocker spaniel. This pattern adds color and sophistication all at once. Herringbone: You know it’s fancy when you’re casually referencing animal parts in the name. In this era of hoverboards and robotic jar openers, even socks are ripe for innovation. Why not absolutely slather your feet in the future? Of course you shouldn’t pair a white tube sock with an argyle dress sock—the socks on your feet should always be the same brand, length and thickness. But even mismatching can work for an edgier wardrobe. The pair shown above? They’re from Stance and actually come in a mismatched striped print. Cool. If you’re able to find an aesthetic union between two different socks that works with your outfit, we say go for it. It’s 2016. Besides, if JGL is wrong, who wants to be right? Want to get your socks on lock? Ask your Stylist for a pair when you order a Fix.